Have you ever wanted to chat back and forth like the pit crews at the track? With the Racing Intercom System you can. With incredible audio quality, the Racing Intercom System from Race Day Electronics sets the new standard in the industry. These professional grade headsets will provide you with an all new experience at the race track. Use with single or dual scanner inputs. 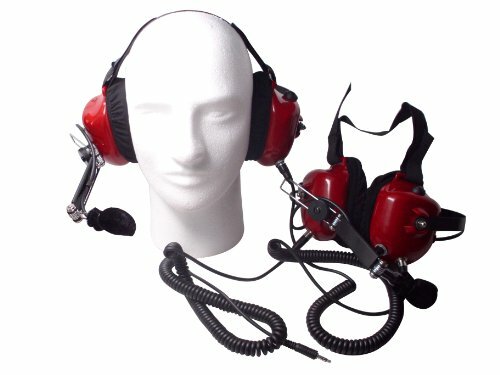 Can be used as a single "listen only" headset or link multiple headsets together. Same style headset the crew chiefs wear. No bulky external intercom box to connect to, intercom is built into the headsets. The industries best fan communication system. Complete communication system includes: 2 headsets and wiring. This communication system allows you to talk to one another over the headsets while at the track. Plug into scanner (not included) to listen to in car communications between teams while talking over headsets. This system does NOT include the scanner itself. Communication system will work with or without a scanner (great for industrial uses). If you have any questions about this product by Race Day Electronics, contact us by completing and submitting the form below. If you are looking for a specif part number, please include it with your message.